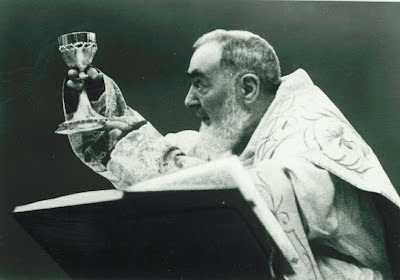 One day, I was on retreat with a priest and noticed during Mass that he was using an ancient, very worn-out-looking chalice. I couldn’t help noticing just how awful the condition of the chalice was and just how ugly it looked. Being a devout Catholic with some aesthetic sensibilities, I felt very sorry that Jesus had to be offered up in such an unworthy vessel (cf. St. John Vianney, St. Padre Pio, and the profound reverence of other saintly priests; reading just a few paragraphs of their lives will quickly increase your devotion at Mass). Just a few days later, the two of us were having Mass again together, and I was amazed to see the very same chalice – but completely regilded in gold and sparkling with radiant light! It was like night and day: a total transformation. But the priest was just as amazed as I was. We soon realized that neither of us had regilded or polished it, and we had no idea who did it since we were the only ones staying there that whole week… A small miracle! Throughout this whole mysterious set of events, it struck me very strongly that the chalice, in addition to symbolizing Christ’s Passion suffered for love of us, also represents us. In a mere instant, God can restore us fully to grace through confession and communion received worthily with faith, humility, and love. Our baptismal innocence can be completely recovered. Every day is a new day; every moment is a new moment. Let us begin again.